The longer and bigger the war in Ukraine becomes, the more lucrative it becomes for US politicians and big business, says Alexandr Khrolenko, a columnist for the RIA Novosti information agency. The pro-independence militia in the Donbas are in the process of liberating new territories. The encirclement of a large group of Ukrainian forces numbering in the thousands is taking place around the city of Debaltseve; a narrow gap in the front there is soon set to be eliminated. And nevertheless the war will continue, and for a long time, because even in the limited Donbas format, it will result in profits for American corporations. Over the course of two weeks, according to data released by the hacker organization ‘CyberBerkut,’ the Ukrainian armed forces suffered over 1,000 fatalities and more than 100 of their tanks were destroyed, with dozens of soldiers and officers surrendering to the militia. These days, the US needs Ukrainian casualties. 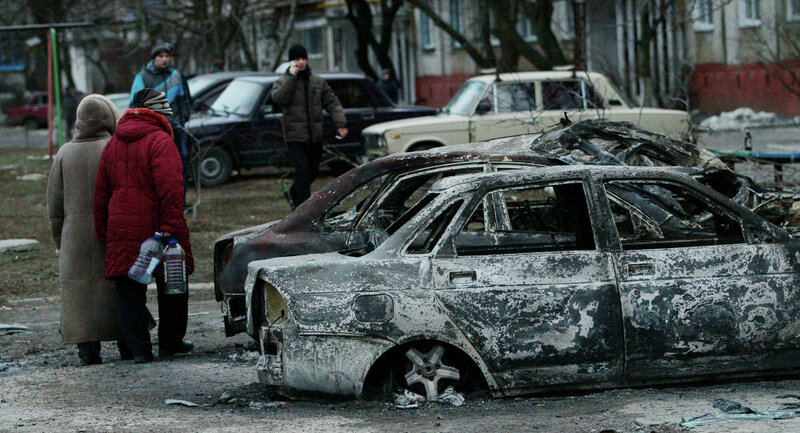 Kiev is being forced into a war. On January 24, US Vice President Joe Biden discussed the situation in Donbas with Ukrainian President Petro Poroshenko. The pair condemned the violence and expressed their conviction that “the costs for Russia will continue to rise” for its alleged aggressive actions against Ukraine. The possible [new] victims and the idea of Ukraine being responsible for the conflict are not even being considered; Poroshenko was given a carte blanche and an indulgence. Shortly thereafter, the Verkhovna Rada officially declared that Russia is an aggressor nation, as if this was another step toward the direction of a peaceful resolution of the conflict. Ukraine and the European Union serve as subordinate instruments of US foreign policy. The Europeans are being pushed headfirst toward war. On January 28 in Washington, US Assistant Secretary for European and Eurasian Affairs Victoria Nuland urged NATO to deploy command posts and to create rapid-reaction forces to its eastern members. “We must install command and control centers in all six frontline states as soon as possible,” Nuland noted. She explained that “NATO is a defensive alliance,” and that “our goal is deterrence of aggression,” but “if that fails we have to be ready.” In other words, she’s asking NATO to be ready to stage preemptive attacks. Europeans are being convinced of the need for war with Russia, setting them up for the next advance on Moscow and beyond. We have seen how large scale military defeats have forced Ukraine to the peace talks table [in Minsk], following which Kiev saves up its strength, and once again throws its troops into the Donbas region. This can continue on for a long time. However, the lack of fighting spirit and the degradation of the Ukrainian economy will sooner or later have the potential to turn thousands of Ukrainian radicals, now with combat experience, toward a new Maidan. At that point, Poroshenko can be saved only by the direct (military) intervention of the European Union and the United States. In the heart of Europe, on the borderline separating two worlds, each of them nuclear-armed, the flames of war continue to grow. This entry was posted in Democracy & Liberty, War & Terror and tagged civil war, Donbass, EU, Kiev, NATO, Ukraine, USA. Bookmark the permalink.